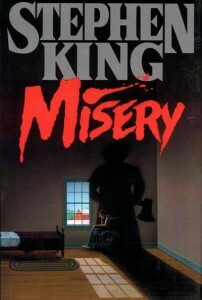 Of course I still glean a great amount of joy from reading, but it is no longer just for fun, because I’m also thinking about how the book was put together, why the writer chose a particular point of view, what function this minor character provided to propel the story forward, how I might have written a sentence differently, etc. “Reading is like a job to you now,” a friend once told me, and he was right. Once you’ve written a novel, reading one becomes a more involved affair. It’s sort of like driving a car without knowing what’s underneath the hood, but once you’ve taken an engine apart and put it back together, you’re more interested in the internal workings of the machine. Recently I finished reading four novels. I was trying to find a common thread between these four books, beyond the obvious fact that I read them in succession, and you know what? They’re all 292 pages long. Was it just coincidence, or was some greater power at work? By the time you get to the end of these reviews, you’ll have your answer. Meanwhile, let’s get down to the nitty-gritty. Analysis: That’s a hell of a first line. Right away we know that somebody is dead, and that our narrator is in the process of getting rid of the corpse. Intrigue, death, it’s all there in that single line. And the story will involve a boat, which means this is an adventurer that’s not gonna be limited just to land. I love this first line. Analysis: A wise writing teacher of mine once told me something some other wise teacher once told him: the writer doesn’t choose the voice for his or her novel, the novel chooses the voice. That might sound like writer-speak mumbo jumbo, but I think there’s a fair amount of truth in it. After Life is about a woman who kills her boyfriend. We don’t know why she commits this murder until much later in the book, and because the narrator is holding back that crucial part of the story, it makes sense for it to be told in the first person, which also has the added potential for unreliability. Structure and setting: Linear, by and large. Upstate New York and New Orleans. Analysis: The first chapter takes place right after the murder. The second chapter travels back in time to the narrator’s childhood in New Orleans. We stay in the present from the third chapter until about three-quarters of the novel, at which point we get to the truth of the murder, going back to the scene of the crime, then it’s pretty straightforward plotting. The bulk of the book stays in the fictitious Train Line, New York, a town of psychics and mediums that’s based on the real life Lily Dale community that’s near Chatauqua, New York. Have I mentioned that this book goes into great detail about mediums and their wacky work? Our narrator, Naomi Ash, is a medium, and she’s the one who killed her boyfriend. Which means theoretically, she could communicate with him from beyond the grave. It’s a great hook. Did anything go wrong, and if so, how could it be improved: Something did go wrong, and I’m not sure if it can be improved. Once we find out why Naomi committed the murder, the air goes out of the novel. Thankfully, this happens late in the game, but I’m afraid this sort of a letdown is built into the mystery/thriller genre that this book sort of treads. There’s nothing but suspense as we work up to the cause, but once the proverbial cat is out of the proverbial bag, we wait for the inevitable fallout. Weird and heart: A writer friend once told me that his favorite books were weird and had a heart. After Life has both. The weirdness rises from the dingy world of the mediums, Ellis’s pointed depiction of the Train Line and its paranormal-obsessed inhabitants. And at the core of this book is a love story between Naomi and Peter, how something that was once right turned very wrong. Ellis set a fairly conventional confessional murder mystery in this strange town, and it works beautifully. Analysis: The next sentence is, “I’d been sleeping late.” In one of my undergrad fiction workshops, my instructor told me that under no circumstances were we ever to start a story with our character waking up. Ohlin kinda-sorta does this – not exactly waking up, but talking about waking up. So is it a no-no? We all know rules are made to be broken, and it’s not like we’re seeing our narrator, Lynn Fleming, stretch out her arms, brush her teeth, and wonder about what she’ll have for breakfast. No, she wakes up because her mother, who called to tell her that her brother is missing. With a pronouncement like that, Ohlin gets a pass. Analysis: This book could’ve been written in the third person limited, except then we wouldn’t get as much of the acerbic taste of Lynn’s personality. Which actually might not be a bad thing. This is a curious novel, because the narrator is not a pleasant person, often angry at the world and short with everyone. She’s the sort of person you’d notice at a party because she’s attractive, but once you got talking with her, you’d probably find a way to excuse yourself. So why keep reading? Because she’s also often observant, smart, and witty. Structure and setting: Linear. New Mexico. Analysis: The narration travels from point A to point B, so there’s nothing crazy happening here. There isn’t exactly a deep mystery, either, because her brother Wylie shows up just a few chapters into the novel. So what is this book about? It’s a family drama with a rather unusual backdrop. Because besides taking place in Breaking-Bad-land, much of the action is supplied by an eco-terrorist group of which Wylie is a member. For me, this was the highlight of the book, getting into the world of these environmentally-friendly, Pigpen-esque vagabonds. Much like the world of the mediums in After Life, The Missing Person became a fascinating read because we got a great glimpse into unfamiliar territory. Did anything go wrong, and if so, how could it be improved: Like A Catcher in the Rye, The Missing Person has a disillusioned, pissed-off-at-the-world narrator. Except unlike Holden Caufield, Lynn Fleming is in her mid twenties and should know better. Is it wrong of me to want to like the person telling the story? I don’t think so, but at the same time, I can’t shake the pettiness I feel. I wish she were kinder, gentler, not by a whole lot, but just slightly more rounded off at the edges. Bevels! Bevels are good. One of the golden rules of good writing is not relying on adjectives and adverbs and opting for concrete nouns and verbs. I believe the same can be said of sentences, that the more specific you can make it, the stronger its impact will be. Ohlin could’ve easily written this sentence without the stream hitting Lynn’s right shoulder, but for me, that right shoulder is what makes this so perfect. Weird and heart: Yes and yes. The eco-terrorism makes this novel, gives it the weirdness, and although Lynn’s heart may be colder than I like, it has plenty of places to beat. The complicated family dynamics between her brother, her mother, her dead father, and her mother’s boyfriend makes for pointed drama. Analysis: The second sentence might be more indicative of the novel. It goes: “The first words Julian Wainwright ever spoke, according to his father, Richard Wainwright III, graduate of Yale and grand lubricator of the economic machinery, and Julian’s mother, Constance Wainwright, Wellesley graduate and descendant of a long family of Pennsylvania Republicans.” That’s a long one, but the setup of this novel is plainly present in all those words. The dude is rich and colleges will probably factor into the plot. 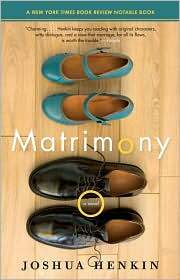 Matrimony is about college, but as the title of the novel suggests, it’s also about marriage. It’s not a wham-bam first-second line, but they do their job. Narrative Voice: Third person limited. Analysis: I believe a lot of first-time novelists write in the first person. It just feels natural to do so, telling a story from the character’s point of view, putting yourself in his or her shoes and saying I felt this or I saw that. This is Henkin’s second novel, and I have no idea if his first, Swimming Across the Hudson, is written in the “I” voice. I could find out, but then if that one, too is written in the third, then I’m gonna feel like a chump for what I’ve written so far, so let’s move on. Matrimony is told from Julian and his girlfriend/wife Mia’s points of view, though never together, thus third person limited. There is no rapid-fire switching, either, each character taking control of long sections, and it’s probably split 70/30 in Julian’s’ favor, so he’s our guy. What I like is that we are seeing things from the point of view of the rich guy. In most novels of this type, the protagonist is almost always the not-as-rich guy, who in this case is Julian’s friend Carter, since most people are not rich and would better identify with the middle-class mope, so I’m glad Henkin took the more challenging route. Structure and setting: Linear. Northington, MA; Ann Arbor, MI; Berkeley, CA; Iowa City, IA; New York, NY. Analysis: Like the other two novels I’ve mentioned so far, this one, too, doesn’t perform any temporal acrobatics. What is interesting, though, is how the changing locales dictate the structure. The story starts with our characters in their freshman year at Graymont (fictional college in a fictional town), and the novel’s sections move (and are titled) from town to town, until we come back full circle to the college, when the kids are now grownups and back for their 15th-year reunion. I really enjoyed the way Henkin laid this book out. With each new town, we get acquainted with our characters in their new environments, and it becomes a travelogue as we see them eat at Zingerman’s (Ann Arbor) and Chez Panisse (Berkely). Moving these characters to different physical locations is a great way to move the plot forward, because it gives them things to do, whether they’re painting their house or enduring the bitter cold of a Michigan winter. Did anything go wrong, and if so, how could it be improved: This book is very solid. No complaints from me. Well, maybe one. Why did Henkin use real colleges and towns (Iowa Workshop, U of Michigan, Berkeley, etc.) but opted to fictionalize the richest part of the novel, Graymont and Northington, MA? I don’t know what he gained from this obfuscation. Having visited Ann Arbor and Berkeley, I liked seeing the familiar landmarks; it brought me closer to the book. Weird and heart: Not weird, but plenty of heart. Number of pages: 291. But there’s a blank page after 291, so close enough. Analysis: If that first line sounds like something written by Robert James Waller of The Bridges of Madison County fame, well, that’s because that’s what Hely is parodying. At the beginning of each chapter of this novel, we’re treated with some portion of our protagonist’s writing, whether they be an excerpt from his novel The Tornado Ashes Club or a snippet of his drunken tirade/speech at his ex-girlfriend’s wedding. A better representative for the rest of this novel might be the first sentence after the excerpt: “You have to understand how bad things were for me back then.” Then the narrator describes his morning to us, much like how Ohlin’s novel starts, so once again, we’re skimming in the dangerous character-waking-up territory. But when the routine involves peeing in nearby bottles (too lazy to get to the bathroom) and sleeping in jeans (because they double as a napkin), it’s good enough to bypass this semi-rule. Analysis: Ellis, Ohlin, and Hely are all first time novelists here, and all of their books are written in the first person. And I couldn’t resist – I looked up Henkin’s first novel on Amazon, and sure enough, that one is also written in the first. Cased closed! Anyway, I can’t imagine this book in any other mode. It’s one of the funniest books I’ve read, and there’s no better way to get into Pete Tarslaw’s personality than to hear it from him. That’s not to say that you can’t do humor in the third person. The funniest book I’ve read is Douglas Adams’s The Hitchhiker’s Guide to the Galaxy, and it’s written in third person omniscient. 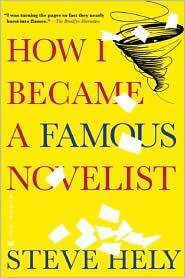 Both Hely and Adams are comedy writers slumming as novelists (Hely has written for Letterman and American Dad; Adams wrote for the BBC and Monty Python), and it bears to mention that a novel like Hely’s is an unusual product. Comedy writers in general are not known for sustained works like novels. For example, Jon Stewart’s America and Stephen Colbert’s I Am America! are both hilarious works, but those works are more like collections of sketch comedies. The remarkable thing about both Hely’s and Adams’s novel is that they are consistently, continually funny. On just about every page, there’s something that’ll either make you smile or laugh out loud. Structure and setting: Excerpts, snippets, bullet points, fake New York Times Bestseller list, but the story itself is linear. Most of the action takes place around Boston, though the setting doesn’t really play here. Rule 2: Write a popular book. Do not waste energy making it a good book. Rule 3: Include nothing from my own life. Rule 4: Must include a murder. Rule 5: Must include a club, secrets/mysterious missions, shy characters, characters whose lives are changed suddenly, surprising love affairs, women who’ve given up on love but turn out to be beautiful. The sad part of this satirical list is how on the money it is. But such is the literary world we live in. Did anything go wrong, and if so, how could it be improved: There’s a moment near the conclusion of the book where Pete has a run-in with the writer he most despises/admires, Preston Brooks, and I wish it could’ve been more of a debate than a diatribe. Because even though we know Pete has done wrong, I didn’t think it was necessary for him to be so beaten down by the ridiculous Waller-like figure. It’s an odd moment for the reader, because it almost feels as if we’re asked to side with the buffoon. Weird and heart: It’s a little of both, but mostly, it’s just funny. It’s been nominated for the 2010 Thurber Prize, and rightly so. I hope it wins. Number of pages: 322, which is a far cry from 292, but if you go on Amazon or B&N, you’ll see it listed as 224 for some reason. So I feel okay with lying. And there you have it. Four good books, with something to learn from each one. T.S. Eliot once wrote, “Immature poets imitate; mature poets steal; bad poets deface what they take, and good poets make it into something better, or at least something different.” I’m a wholehearted believer with everything I read – steal what you can, make it yours, make it better. and an 8 page title form with 4 blank coverleafs. These are some nice, consise reviews, Sung. And the structure of this piece makes me want to go back through my last few literary selections and see what linking threads I can find. Of these four, After Life appeals to me the most, I think – I was more or less hooked by that first line. Thanks, Matt. 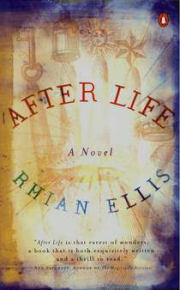 After Life is really quite a good book, totally worth your read. We see how Naomi becomes a medium, and that whole process is just really fascinating. Throw in the murder, and you have something really special. Ha! What is coincidental is that, after years, I was browsing through some Donaldson the other day, and thinking Man. I wonder if I could sneak in a reference on TNB without appearing like the lowest-brow person on the site? Oh, Nick Succorso. You’re boning the ladies in space-heaven, now. I’ve wondered if it’s possible to lose all enjoyment in books from putting on a different set of lenses to read them with. And if the price of what you might learn from that would be worth it.